I like making resolutions . I’m pretty bad about looking back at them though. Maybe it is guilt. Knowing I’m not doing something I wanted to be. Although I’m DEFINITELY not going to be doing it if I can’t remember what it was. It makes no sense. It doesn’t hurt to reread things every now and then. So I made myself look back at my 2016 Goals. With some deep breathing. It actually wasn’t that scary. I’m doing better than I thought. Sign up for races? Half marathon and Spartan Super, check. Take more long trips? Multi-day trips to Marrakesh, Sicily, and Lake Garda, check. Wear a bikini? Checkity check. It looks like I could stand to do more in the way of photo projects, decluttering, and connecting with family. But in general I’m doing what I said I’d do. One resolution was nagging at the back of my mind though. Reading those random Clancy books on the bookshelf. The books that we brought with the express purpose of reading and passing on. There they sit. Weighing down the bookcase and my conscience. Why is this not happening? Before you question whether I should be reading them at all, because, yes, life is definitely too short to read bad books, I do like them. I think it is a combination of (1) having plenty of other books I want to read and (2) holding a real book–especially a fat paper back–is ANNOYING. Yes, I’ve gone full Team Kindle. The only thing I don’t like about my Kindle Paperweight–that will NEVER die even though James has been trying to prepare me for that day–is that I can’t press books into the hands of friends when I’m finished with them. Otherwise, a book is unwieldy. I get hand cramps. I have to use my bedside lamp. Frustrating. Since you know I love a good blitz challenge, I started thinking about applying the same here. A Tom Clancy bender. A summer of Clancy. What if I crammed the whole lot by Labor Day? Then I did some math. And realized the futility of this exercise. 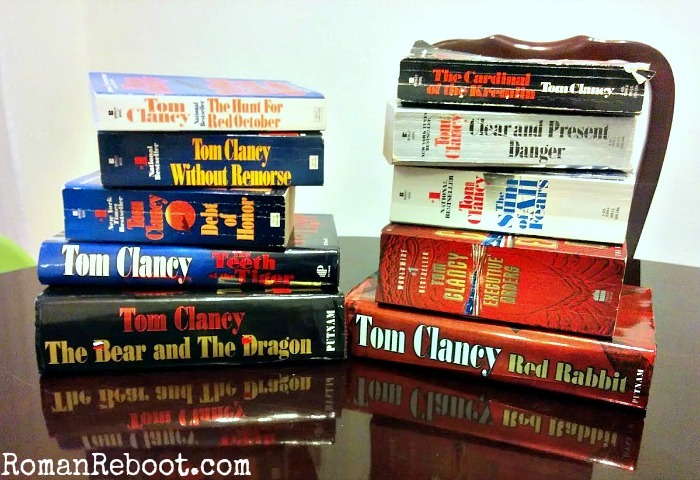 I’ve got about 7, 808 pages of Clancy books. A few days ago when I did my calculation, that would be about 180 pages of reading PER DAY. I tried my best, but it took me about three days to read that much. Does this mean it would take me three times as long to finish?? Probably longer actually. Because everything takes longer than you think it will. For now I’m sucked into The Hunt for Red October and plowing my way through there. After that, I’ll reassess. Maybe the new rule will have to be one Clancy book before turning to something new on the Kindle. But I worry that once I set the Clancy down again it will be hard to come back. I know I could throw money at the problem. I could get these books on kindle or audio book or such to fix the annoyingness of books. But I don’t want to do that. I don’t know. Any ideas? Anyone done a reading blitz? Good luck! I hope those are at least accompanied by some interesting images. My experience with Clancy is that they become predictable fast. I think you’ll enjoy them more if you space them out. You don’t want to remember the plot of the last one too well when you pick up a new one. I don’t think I could handle that vast amount of Clancy, but I have managed to finish three books I’d been looking at for several years. They are not thrillers, but they held encouragement and insight that I needed at this point in life. “Having a Mary Heart in a Martha World”, “Beautiful Mercy” and “If Aristotle’s Kid had an I pod”. I wish you well. And you are doing a much better job of keeping in touch with family. We’ll try to reciprocate!